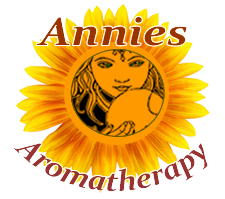 Preparation Methods & Dosage :Tea or tincture, salves, lotions and poultices. The herb tea has a light, enjoyable, slightly woody taste that is improved with lemon and a bit of honey. Fresh leaves can be eaten in salads. 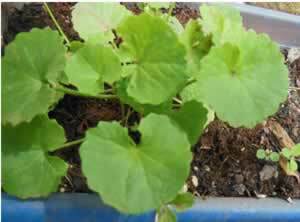 Gotu Kola Side Effects: Be cautious if you are taking prescription drugs for depression, high blood pressure, or high cholesterol. Extremely large doses might cause nausea. Low lying herb with umbrella like leaves that are a favorite food for elephants, Gotu Kola is part of the parsley family (and unrelated to the cola nut)and grows in tropical Africa, South America, Asia and Australia. Gotu kola got the nickname tiger's herb because injured tigers often rub against it to heal their wounds. 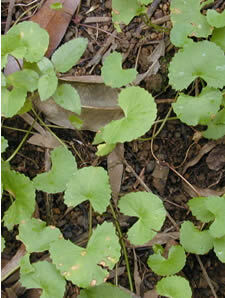 Gotu Kola features in both Chinese and Indian myths and folklore. The Tai Chi Chuan master Li Ching-Yun purportedly lived to an advanced age of over 200 years old, due in part to his use of Gotu kola and other Chinese herbs. In Sri Lanka there is a tale of a 10th century king who claimed gotu kola (In sinhalese Gotu = conical shape and Kola= leaf), provided the energy and stamina to satisfy his extensive harem. Linda B. White, M.D.. "The Herbal Drugstore" Rodale, (2003) The active ingredient, asiatic acid, is particularly effective in stimulating synthesis of collagen, a prominent component of the deeper layers of skin. Phyllis A. Balch. "Prescription for Herbal Healing" Avery, (2002) Gotu kola is an excellent vasodilator and tones the blood vessels allowing more circulation to problem cellulite areas.